Meet the industry’s first adaptive, threat-focused next-generation firewall (NGFW) designed for a new era of threat and advanced malware protection. Cisco ASA with FirePOWER Services delivers integrated threat defense for the entire attack continuum - before, during, and after an attack - by combining the proven security capabilities of the Cisco ASA firewall with the industry-leading Sourcefire threat and advanced malware protection features together in a single device. The solution uniquely extends the capabilities of the Cisco ASA 5500-X Series Next-Generation Firewalls beyond what today’s NGFW solutions are capable of. Cisco ASA is the world’s most widely deployed, enterprise-class stateful firewall with remote access VPN and advanced clustering for highly secure, high-performance access and high availability to help ensure business continuity. Cisco Security Manager provides scalable and centralized network operations workflow management. It integrates a powerful suite of capabilities; including policy and object management, event management, reporting, and troubleshooting for Cisco ASA firewall functions. For small-scale and simple deployments, the Cisco Adaptive Security Device Manager (ASDM) is available to provide on-device, GUI-based firewall network operations management. Cisco’s enterprise-class management tools help administrators reduce complexity with unmatched visibility and control across NGFW deployments. Cisco ASA with FirePOWER Services incorporates an integrated approach to threat defense, reducing capital and operating costs and administrative complexity. 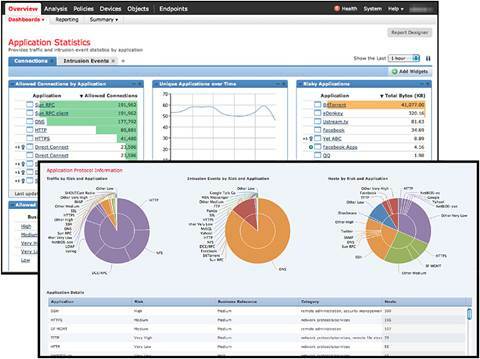 It smoothly integrates with the existing IT environment, work stream, and network fabric. The purpose-built appliance family is highly scalable, performs at up to multigigabit speeds, and provides consistent and robust security across branch, Internet edge, and data centers in both physical and virtual environments. With Cisco FireSIGHT Management Center, administrators can streamline operations to correlate threats, assess their impact, automatically tune security policy, and easily attribute user identities to security events. Management Center continually monitors how the network is changing over time. New threats are automatically assessed to determine which can affect your business. Response efforts are then focused on remediation, and network defenses are adapted to changing threat conditions. Critical security activities such as policy tuning are automated, saving time and effort, while protections and countermeasures are maintained in an optimal state. (4.24 x 42.9 x 39.5 cm) 1.75 x 17.5 x 14.25 in. (4.45 x 20.04 x 36.20 cm) 1.67 x 16.7 x 15.6 in. Maximum throughput measured with UDP traffic under ideal conditions. Multiprotocol = Traffic profile consisting primarily of TCP-based protocols/applications like HTTP, SMTP, FTP, IMAPv4, BitTorrent, and DNS. PN throughput and sessions count depend on the ASA device configuration and VPN traffic patterns. These elements should be taken into consideration as part of your capacity planning. Separately licensed feature; includes two SSL licenses with base system. Higher specifications are associated with the Security Plus license. Usable space dependent upon system software. Derate the maximum operating temperature 1.5°C per 1000 ft above sea level. Cisco ASA with FirePOWER Services include Cisco ASA firewalling, AVC, URL filtering, NGIPS, and AMP. This unique set of capabilities is available on the Cisco ASA 5500-X Series NGFW platforms: Cisco ASA 5506-X, 5506W-X, 5506H-X, 5508-X, 5516-X, 5512-X, 5515-X, 5525-X, 5545-X, 5555-X, and 5585-X with Security Services Processor SSP-10, SSP-20, SSP-40, and SSP-60. The Cisco ASA 5585-X FirePOWER Services SSP-10, SSP-20, SSP-40, and SSP-60 hardware blades are supported on the Cisco ASA 5585-X platform. Cisco ASA 5585-X SSP-10, SSP-20, SSP-40, and SSP-60 firewalls require Cisco ASA Software Release 9.2.2 and later. Cisco ASA with FirePOWER Services software is supported on the Cisco ASA 5500-X Series of next-generation midrange security appliances running Cisco ASA Software Release 9.2.2 and later. Cisco FireSIGHT Management Center and Cisco Security Manager are required to manage Cisco ASA with FirePOWER Services ASA 5512-X, 5515-X, 5525-X, 5545-X, 5555-X, and 5585-X with Security Services Processor SSP-10, SSP-20, SSP-40, and SSP-60. ASDM V 7.3.x is available on-device to manage single instance deployments of Cisco ASA 5506-X, 5506W-X, 5506H-X, 5508-X, and 5516-X with FirePOWER Services. 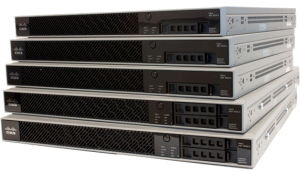 Download the Cisco ASA 5500-X Series with FirePOWER Services Datasheet (PDF).